You get what you pay for when it comes to investment information. A notable exception: The US Energy Information Administration’s massive statistical treasure trove for all things energy, which is free to anyone with Internet access. On June 2, the US Environmental Protection Agency (EPA) proposed a new regulatory framework to cut the carbon dioxide (CO2) emitted by operating US power plants over the next 16 years. In their current form, the rules aim to reduce emissions by 30 percent from 2005 levels. The June issue of Conrad’s Utility Investor analyzed these proposed rules in depth and highlighted the potential winners and losers among power producers. However, investors should note that final approval of the EPA’s proposal is far from a foregone conclusion, especially with control of the US Senate up for grabs this November and the next presidential election only two years away. That same day, The Washington Post ran an article highlighting the environmental implications of the US exporting liquefied natural gas (LNG). The study concludes that US LNG exports won’t raise or lower global CO2 emissions by an appreciable amount, as any salutary effects of Chinese power plants switching from coal to imported natural gas will be offset by leakage from wells and pipelines. Generating the necessary electricity to cool and condense LNG for export also helps to negate these environmental advantages. Cove Point’s opponents have cited the Dept of Energy’s report as evidence that the Federal Energy Regulatory Commission (FERC) should deny the facility’s final environmental and safety permit. Winning environmental and safety clearance from FERC is the last remaining regulatory hurdle for Cove Point. FERC’s staff has already recommended that the export project be approved. The Maryland Public Service Commission has also given its assent–on the condition Dominion Resources pay $40 million into the state’s Strategic Energy Investment Fund over the next five years. Extending the EPA’s review would at the very least delay final approval from FERC, which would push back the initial public offering of Dominion Midstream LP. This possibility has cast a temporary chill on shares of Dominion Resources and raises questions about how readily regulators will approve greenfield LNG export projects. Meanwhile, no fewer than nine facilities in Australia will start to liquefy and export the fuel by early 2015. And ExxonMobil Corp’s (NYSE: XOM) LNG export terminal in Papua New Guinea is up and running and should double its output next year. In LNG Investment Bible, International Edition, we highlighted Oil Search (ASX: OSH, OTC: OISHY) as one of the few pure plays on LNG exports in the Asia-Pacific region. The stock has rallied by 15 percent over the past two months and could head significantly higher if the company ploughs its rising cash flow into the dividend. Elliott Gue and I will attend the Energy Information Administration’s annual conference and will share our takeaways from the event in an Exclusive Video Report for subscribers to Conrad’s Utility Investor and Energy & Income Advisor. The role of government policy in the development of renewable energy. The session on whether policy still matters to renewable energy should be particularly interesting. Although the speaker from the Solar Energy Industries Association likely will advocate for alternative energy, I’m keen to hear what Edward Randolph, director of the California Public Utilities Commission’s (CPUC) energy division, will have to say on this matter. 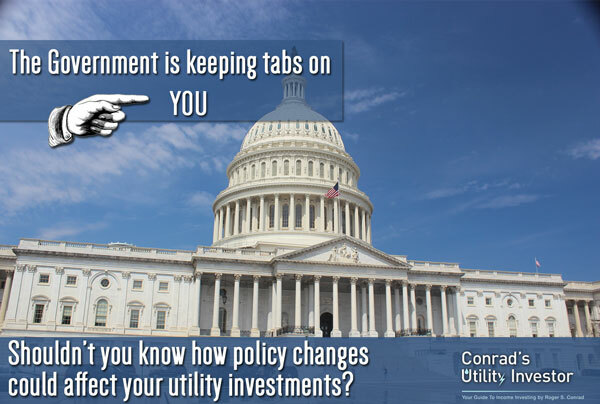 The CPUC sets policies with real consequences for utilities and investors. We also aim to come away with a better understanding of the premises underpinning consensus projections for energy production and demand; intelligence that helps us to identify the exceptions to the rules. Take Entergy Corp (NYSE: ETR), for example, which expects to grow its rate base by 5 percent to 7 percent annually over the next five years, thanks to more than $60 billion in major industrial projects that will be built in its Mid-South and Gulf Coast service areas. This bullish outlook doesn’t gibe with the consensus outlook for zero to low growth in electricity demand. Geography is another huge variable. Hawaiian Electric Industries (NYSE: HE) has posted solid earnings growth, even as more than 11 percent of its Oahu customers have switched to rooftop solar systems from traditional oil-fired plants. The utility has boosted its profits by investing in its grid to accommodate distributed solar power, enabling it to shutter oil-fired power plants that entail higher costs for the utility and higher bills for Hawaiians. This unique situation complicates warnings that the emergence of distributed solar could sound the death knell for traditional utilities. Therein resides the danger of prognosticating from 30,000 feet. The key is to know when to bet with or against the conventional wisdom, which is why we wed a top-down approach that looks at bigger-picture trends with a bottom-up focus on individual companies. That’s why the real value of this kind of conference isn’t in the actual forecasts, or even the numbers. Rather, it’s from putting the opinions and findings of participants and presenters into perspective. Our strength is knowledge of energy companies as businesses. Understanding how these individual businesses work within the bigger picture helps us to pick the best names, which is what Conrad’s Utility Investor and Energy & Income Advisor subscribers can expect from our July 16 Video Report.